One for the album: Liow (right) posing with speakers at the forum (from left) Dr Tan Chong Tin, Datuk Dr Hou Kok Chung, Tan, Tan Sri Dr Ghauth Jasmon, Prof Mohamad and Dr Chandra (front). KUALA LUMPUR: Moderation is the key that opened the door to the formation of our Federal Constitution, says lawyer Roger Tan Kor Mee. “Our Constitution is moderate and balances the competing interests of the country’s various communities. “If not for moderation, we would not have been able to put together a written constitution,” said Tan, who is also a columnist for The Star. He said while the Constitution guaranteed many rights for the citizens, it also demanded that moderation be exercised with self-restraint, self-control and self-discipline. “The thought of resorting to violence should never even cross the mind of anyone,” he said. Tan added that in a moderate society, a person should be able to hold a rational discourse with his peers even on sensitive issues affecting his community. 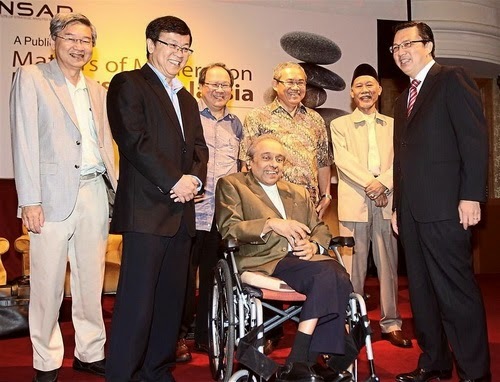 Sharing Tan’s views was Dr Chandra Muzaffar, who advised that different races should speak honestly to each other in dispelling the racial stereotype placed on each ethnic group. Dr Chandra, who is 1Malaysia Foundation’s chairman, clarified his premise by giving examples of Chinese and Malays having distorted views of each other’s communities. “Only with empathy, the ability to place one’s heart in another’s, can such a problem in our country be solved,” he said. Universiti Malaya senior research fellow Prof Datuk Dr Mohamad Abu Bakar advised caution when labelling others as a moderates or extremists. “Moderation can mean different things to different people or in different context. “We must remember, one man’s meat can be another’s poison,” he said. The forum was organised by the Institute of Strategic Analysis and Policy Research. Transport Minister Datuk Seri Liow Tiong Lai, who launched the forum, said MCA would organise a seminar in Mandarin focusing on how the values of ren (benevolence) could be used in governance.